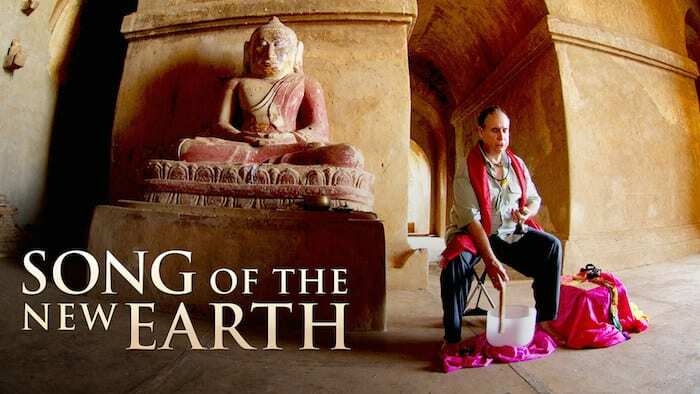 Song of the New Earth is a gorgeous film-experience about Tom Kenyon an extraordinary mystic, channel, shaman, and sound healer (these are only a few of his many gifts). I highly recommend this film for anyone interested in healing beyond traditional paradigms. Tom is a light-bearer and way-shower for those of us who know and sense there is so much more beyond what we know about ourselves, our Earth and reality, and the correction of the place of the Feminine on our planet. Tom works with the Hathors, a group of inter dimensional beings as well as other beings and Earth-dwellers. In this film he eloquently, humbly, with wonderful humor and a psychotherapist’s true skepticism tells us his journey filled with incredible experiences, guidance, and opening to his life’s work. Song of the New Earth deeply moved me. I was especially struck by Tom’s initiation on his 40th birthday where he was taken to the luminous being at the center of the Earth — the Earth’s dreamer — who said Gaia was changing her dream and asked Tom to help sing the new Earth into being. It filled me with great hope and joy for the change we are in. I love Tom’s integration of the masculine and feminine, science and spirituality, the left and right brain, rationalism and mysticism. I love how he is able to enter and help others enter deep psychic and consciousness states with profound love and integrity using his amazing four-octave voice. I am so grateful to him for following his guidance, for being willing, singing, and leading and lighting the way. In addition for his beautiful work with sound as a healing medium, I am grateful to him for so honoring the Feminine, and being a model for men (and women) to treasure, embody and live the alchemical path of masculine and feminine. Tom and this film helped me validate and affirm my own journey, out-of-my-world experiences and mystical guidance that my mind so often questions and wants to put in the box labelled “weird” and “crazy”. It helps me believe more deeply how much beauty, grace, love, and help is coming towards us. Song of the New Earth is a stunning film and experience. See it if you can — there are several viewings all over the country and you can also buy the DVD. Thank you, Tom, for being willing to sing the Song of the New Earth!